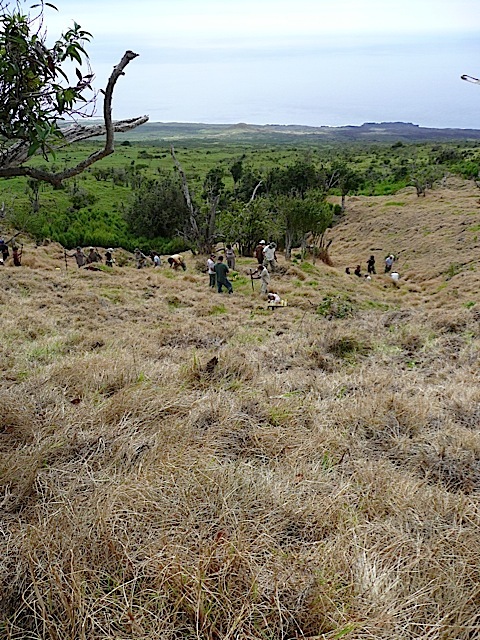 This account is from an Auwahi volunteer on the recent Saturday when volunteers made history—planting out the last of the 23-acre Auwahi II exclosure! 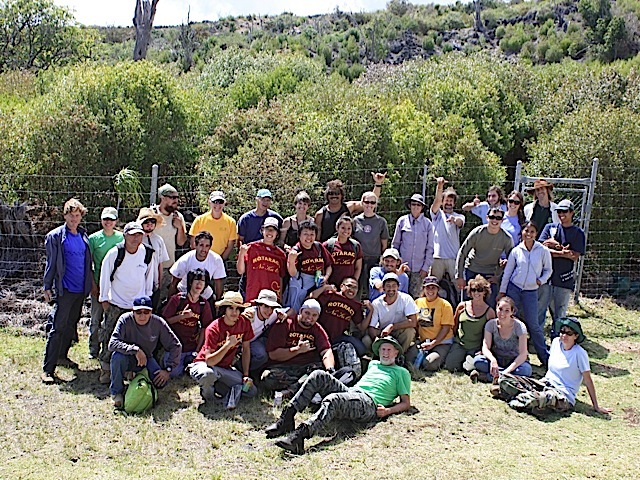 “Last Saturday was another excellent day up on the mountain … thirty-plus volunteers, and over 1,200 trees in the ground, we had kupuna [elders] planting alongside teenagers, and veterans working with first-time visitors. Out on the far western edge of Auwahi II, we planted on an exposed slope butting up against the fence line; there aren’t very many big trees over there right now to buffer the sun’s heat, but the mountain took care of us—we worked in a cool veil of light breezes and rolling cloud cover. “To call it spiritual would be a bit like calling the ocean wet, but here’s the thing. We were planting, laying down a web of ʻaʻaliʻi keiki, and we could hear laughter and the clanging of ʻoʻo beyond the next rise, and then, before we knew it, we had worked our way to the edge of another plot where the ʻaʻaliʻi were already in place, bright splashes of green peeking up through the thick, brown kikuyu mat. It was like we had painted ourselves into a corner. “The fence ran along one side of us and everywhere else that we tried to go, well, the poʻe kokua [volunteers] had already been there, and the foundation was established. It’s a pretty incredible problem to have, if you think about it; after four years, it looks as though the base planting for Auwahi II is in place. Lucky thing, too, since we’ve got a new little plot to malama [care for] next door, Auwahi III, just waiting for the chance to come back to life.